The newly designed MultiStar C hybrid filter combines 55 years of experience in delivering efficient and effective energy management and filter solutions to customers around the globe. The MultiStar C unit flawlessly combines the practical, easy handling of a Vacumobil deduster with the power of the MultiStar filter series. Hocker North America is excited to welcome a powerful new member to the Hocker family. Meet the MultiStar C. Hocker has closed the gap between a deduster and filter systems. Simple and efficient. Period. With 1,000 Vacumobil dedusters and MultiStar filters worldwide, it’s no wonder such a powerful hybrid has been perfected and is now available! The MultiStar C is delivered in 3 pre-assembled modules for quick and efficient assemble. This filter hybrid is used for volumes from 7,000 CFM to 18,000 CFM. The design features low residual dust content (<0.1 mg/m3(H3)) according to the Technical Regulation for Hazardous Substances 553. Plus, it’s tested explosion resistance! The MultiStar C provides the best of the filter and deduster worlds. We have simplified the entry into the stationary filter world and combined the simplicity of a deduster with the power of a filter system. There are six filter housing versions of a MultiStar C, each with three discharge options. That’s 18 ways to implement your ideas! With the Multistar C filter series we cater common to application fields of up to 18,000 CFM volume flow. We have no compromised quality with this newly developed filter and have created a clear price advantage for our customers by means of the modular system. The Multistar C requires just over 100 square feet of floor space and a foundation. It is delivered in three modules and can be assembled and put into operation with the use of a crane within a few hours. That’s quick and easy installation! 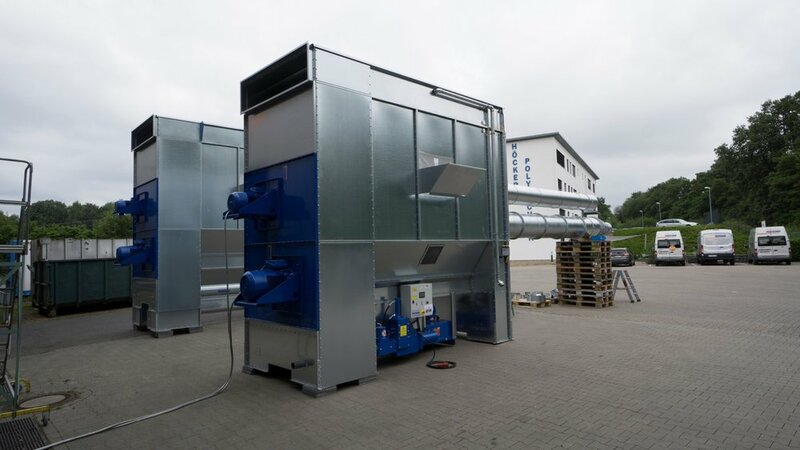 This filter system supports our customers in the wood and plastics processing as well as printing, recycling, folding boxes and corrugated cardboard industries. The energy efficient motors (IE3) and fans have been specifically developed for the MultiStar C and deliver optimum performance with minimum energy input. Use the Hocker control technology (optional) and integrate your MultiStar C into the existing intranet. Check consumption histories and operative statuses comfortably from your sofa! Our filter features continuous cleaning of filter hoses without interrupting production. There is low compressed air consumption that is suitable for almost all materials and types of dust. A constant high extraction performance is achieved due to low filter contamination. Cleaning can be carried out time dependent or differential pressure dependent. The filter also features a very long service life and useful life of the filter hoses. With jet or compressed air impulse cleaning, a nozzle is positioned above each filter hose. A short burst of compressed air inflates the filter hoses briefly and the caking on the filter is blown off. The regeneration of the filter material is carried out periodically or differential pressure dependent. Simply collect the dust in dust/chip bins. The MultiStar C has six bins with a capacity of 275 gallons. Each bin unit has a shut-off segment which allows for the emptying of the chip collection bags during operation. A system shutdown is not necessary. 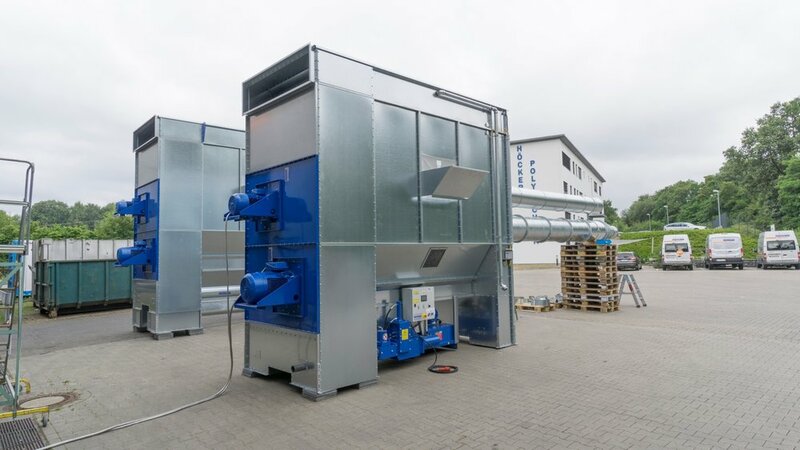 The MultiStar C with integrated briquetting press processes the material directly into briquettes. They are the ideal solution for applications with low or medium material volumes. In briquettes, sensitive types of dust can be easily stored and disposed of dust- free. High quality heating material is produced from wood chips. MultiStar C with airlock filters are perfect for transporting material to other transport systems such as silo and containers. All rotary valves are tested and certified for flame resistance. Even the best filter systems depend on optimum peripheral devices. to help you integrate your MultiStar C filter perfectly into your production. You will be surprised what possibilities this compact hybrid filter can offer you. Talk to us! We work hard to support you with all our experience.